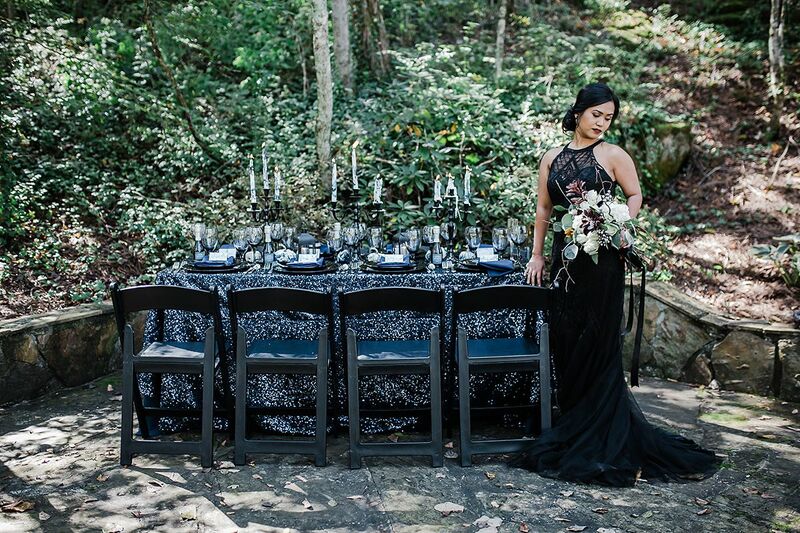 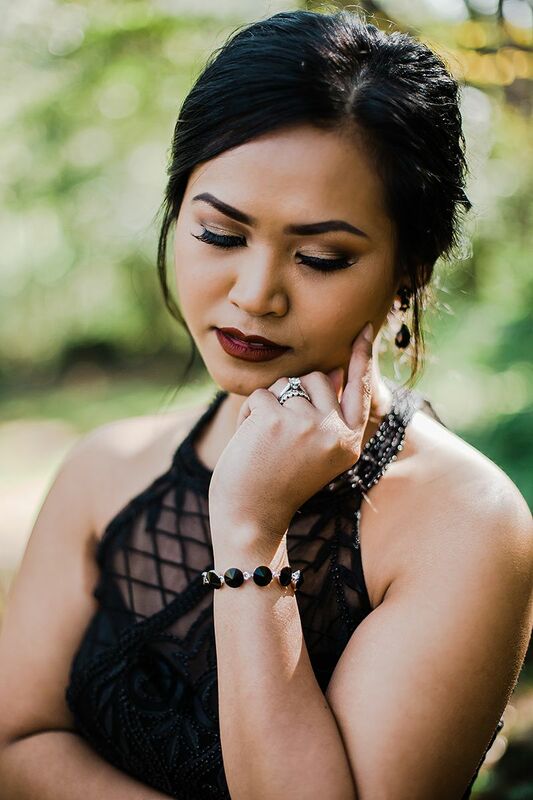 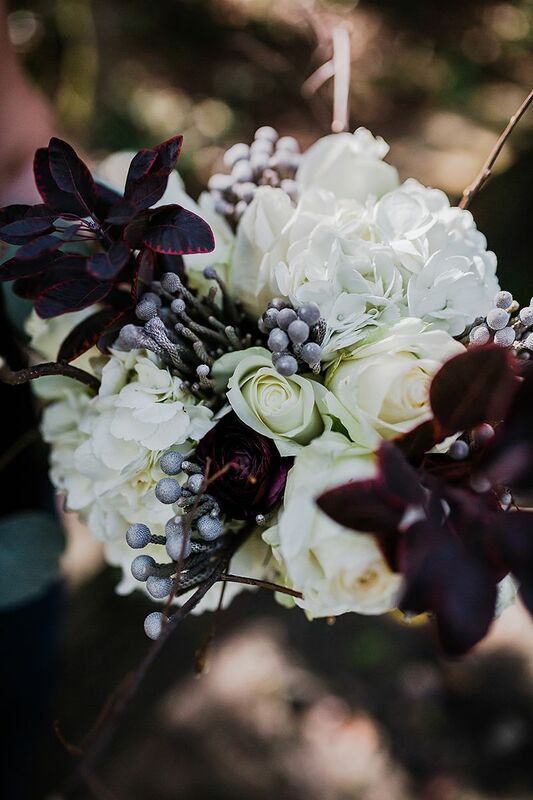 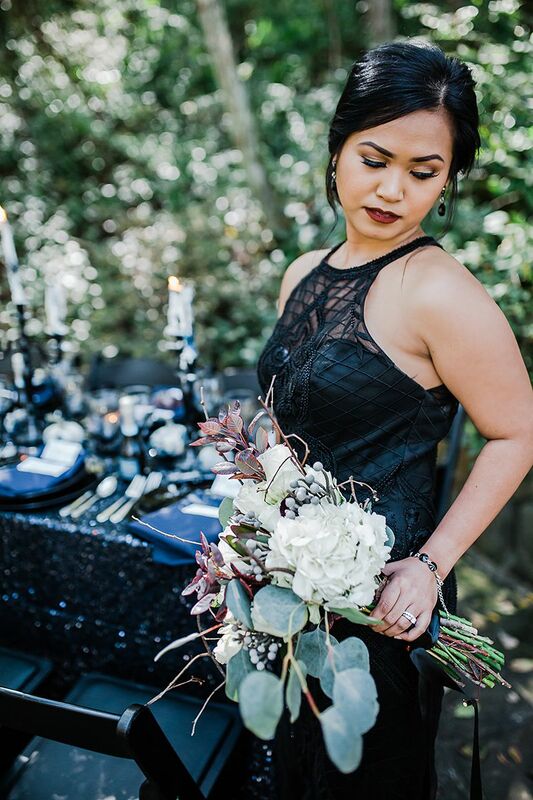 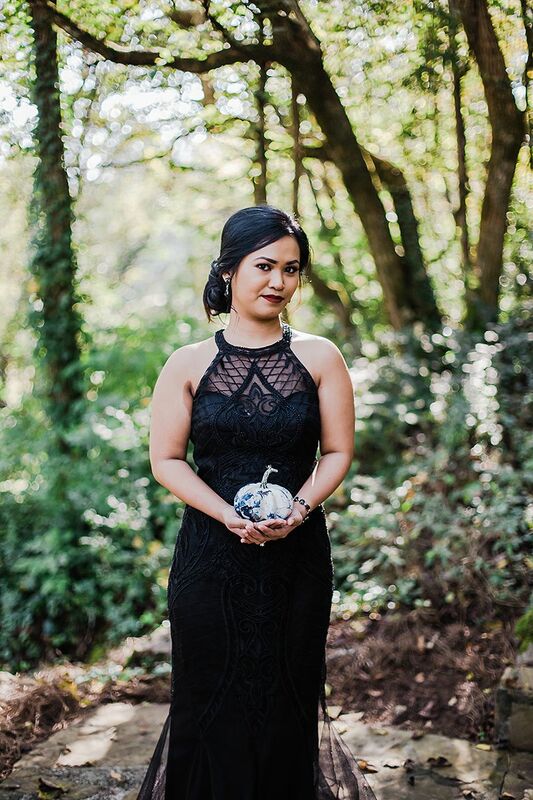 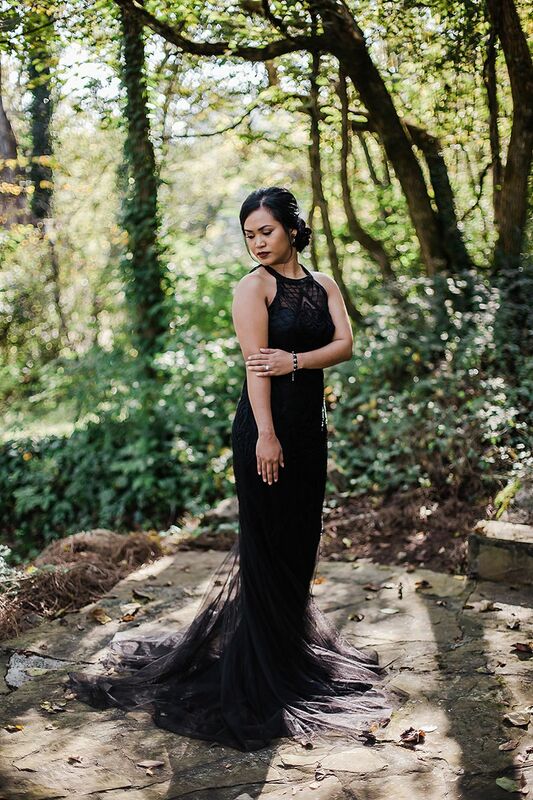 Conveying a certain dark glamour this lush Halloween inspired styled shoot was shot at the breathtaking Dara’s Garden. 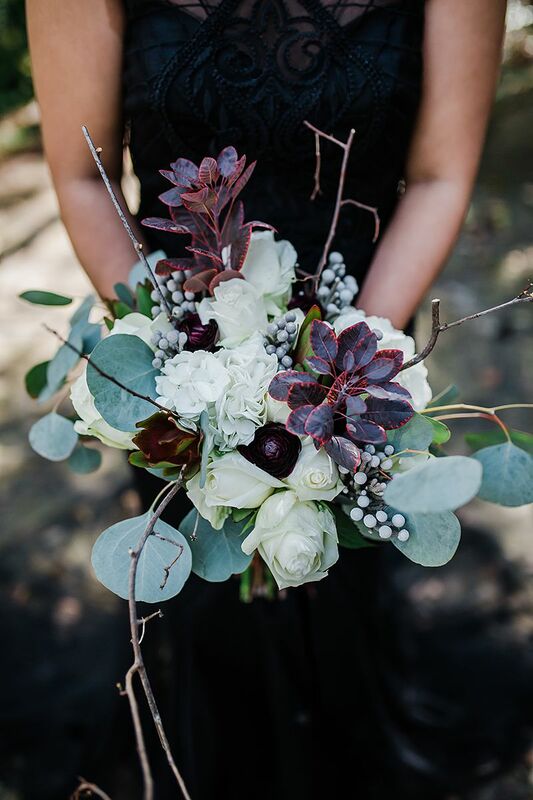 Built around a minimalist colour scheme and a desire to reimagine the holiday’s aesthetic, this shoot from Amber Lowe Photo is a celebration of the beauty to be found in all things devilishly delightful. 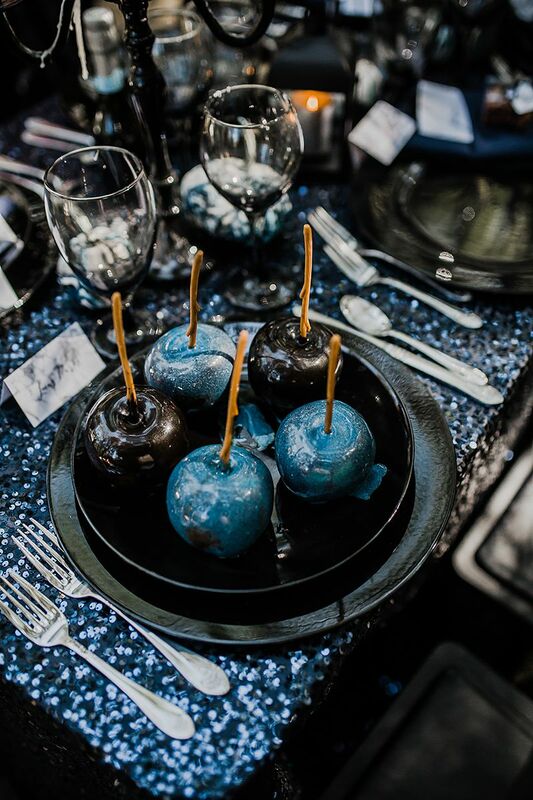 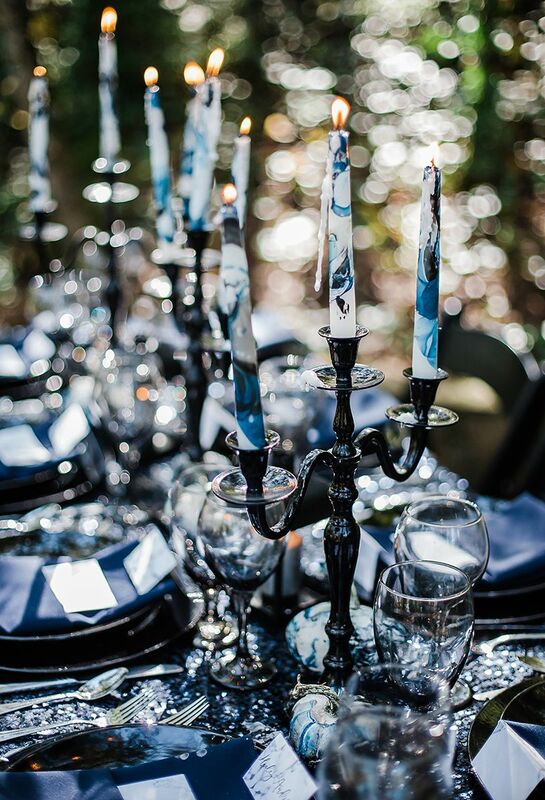 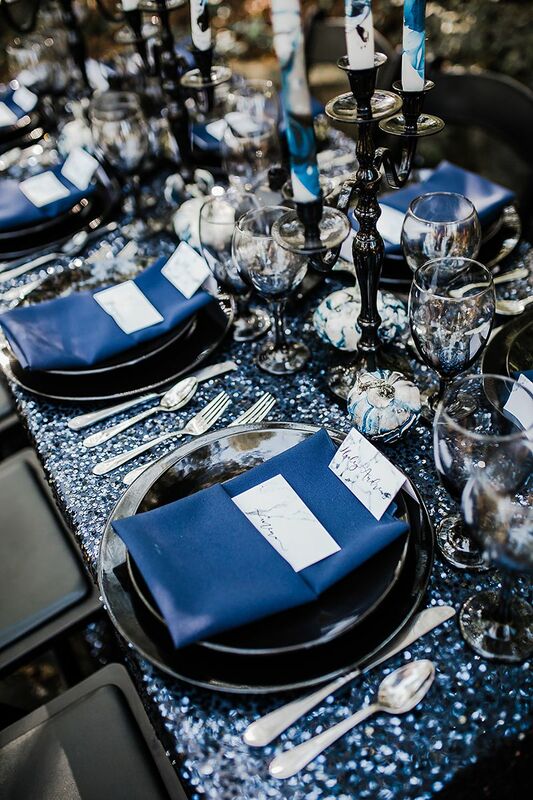 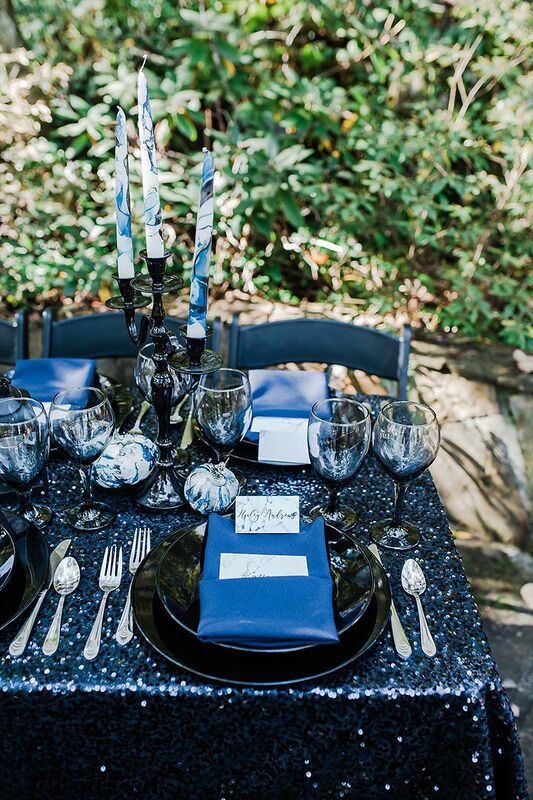 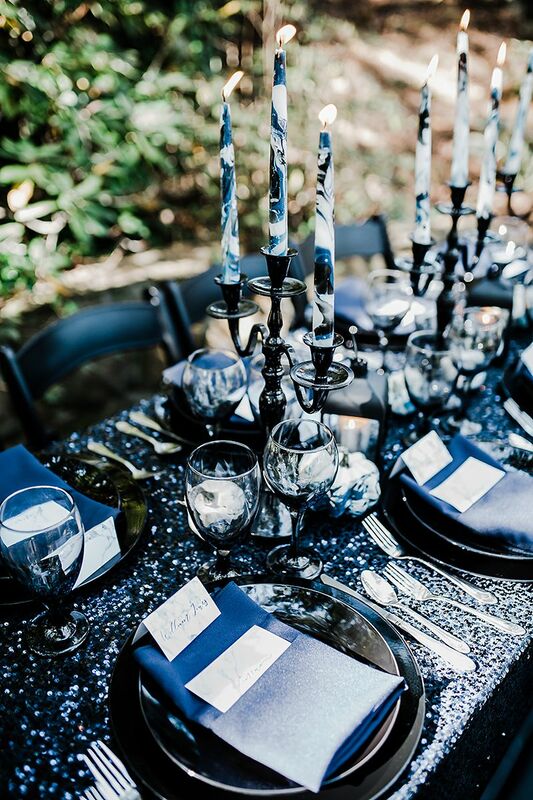 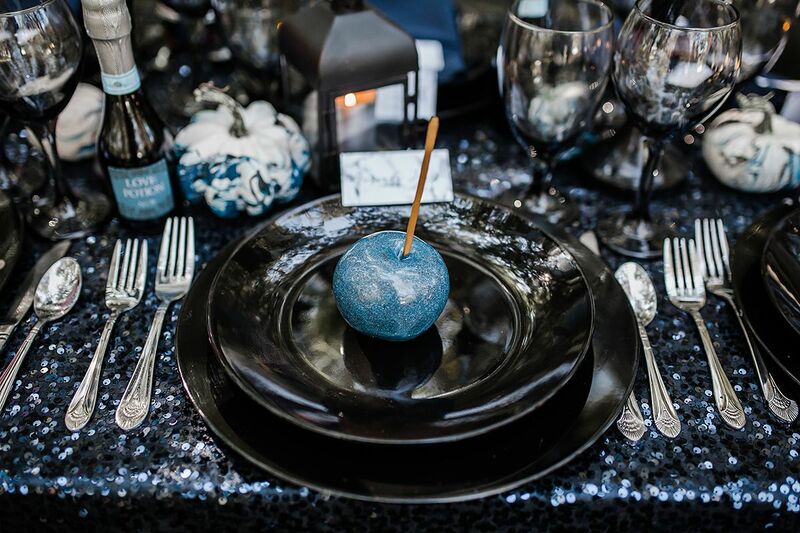 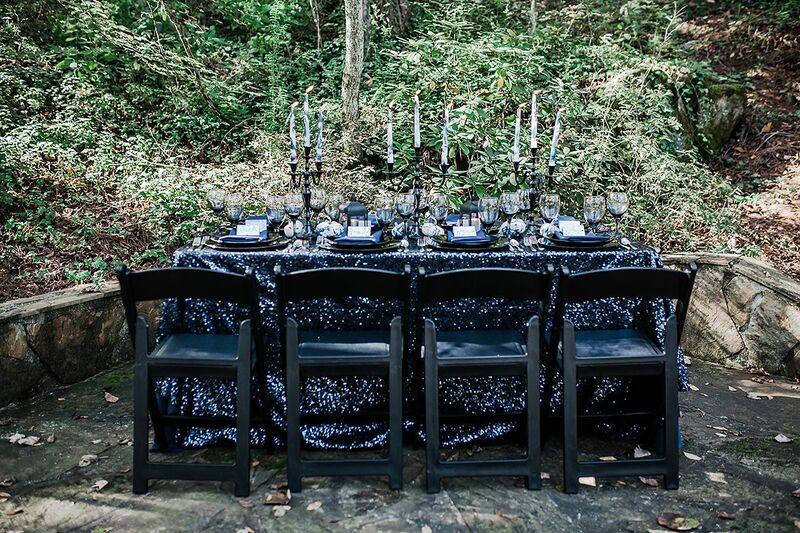 Chanelling love for the dark and dramatic during this spooky season, the event designers at Custom Love Gifts, Events, and Prints chose to stray from the holiday’s ubiquitous black-and-orange color palette and harvest décor accents, instead opting for a monochromatic blackout tablescape with pops of rich blue and marbled details throughout, as well as the glam glitter motif established by White Table’s stunning sequined linen. 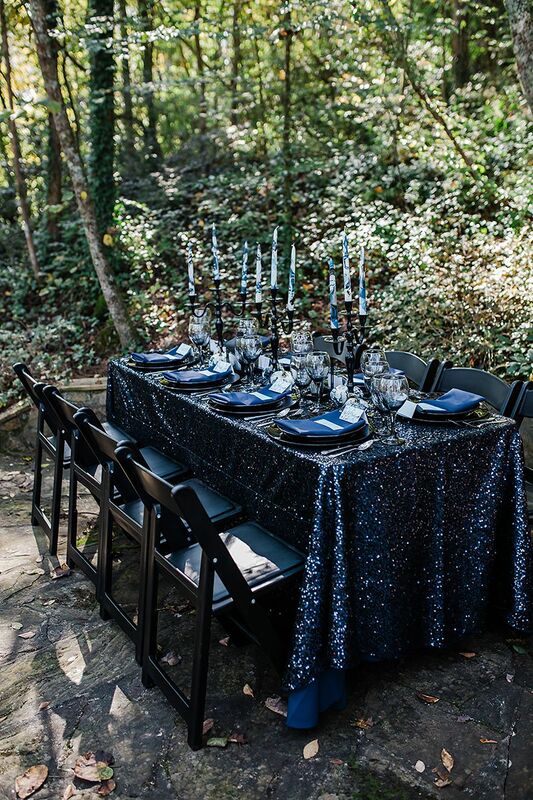 Even the black garden chairs, provided from Campbell Tent & Party Rentals, were a stylistic necessity. 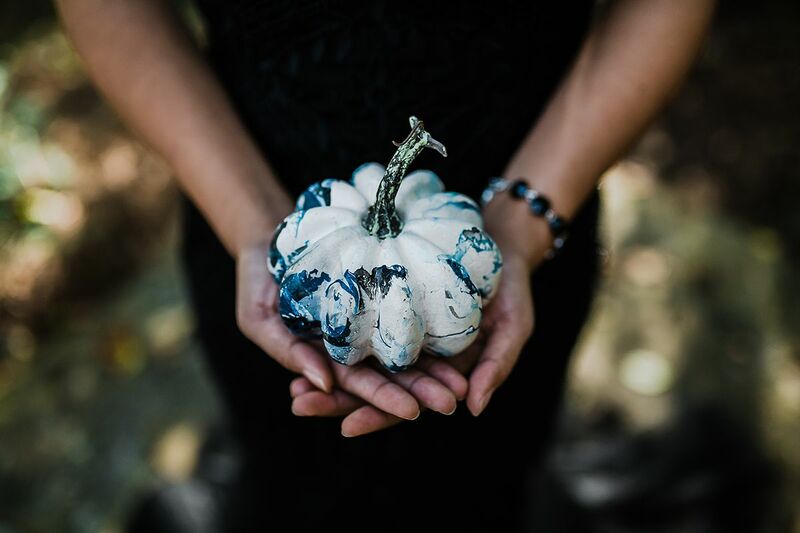 To create an atmosphere which emphasized elegance over the season’s more theatrical trappings, the only pumpkins in sight were small, white, and marbled with navy. 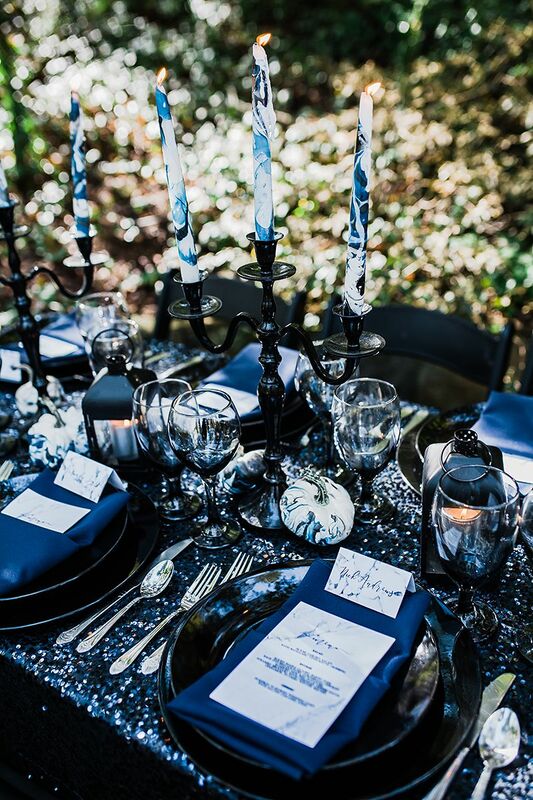 Additionally, substituting custom champagne Love Potion labels for a bubbling cauldron served to elevate this Gothic vignette from graveyard to grandiose. 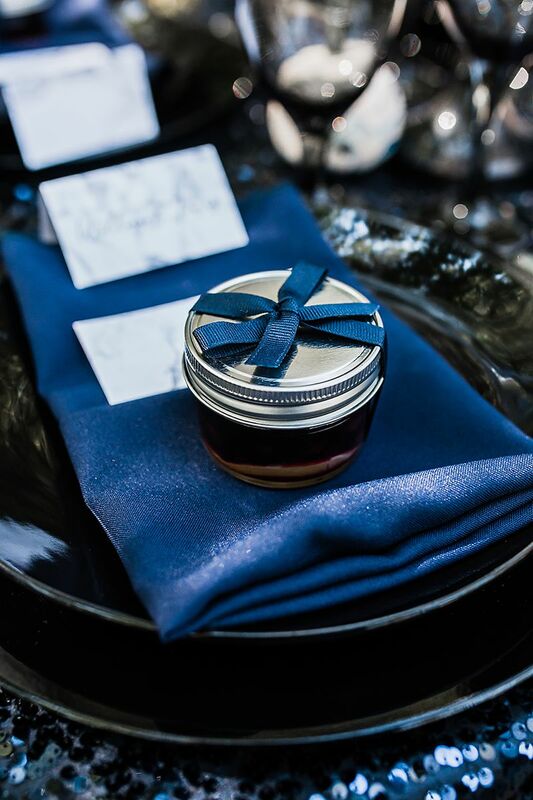 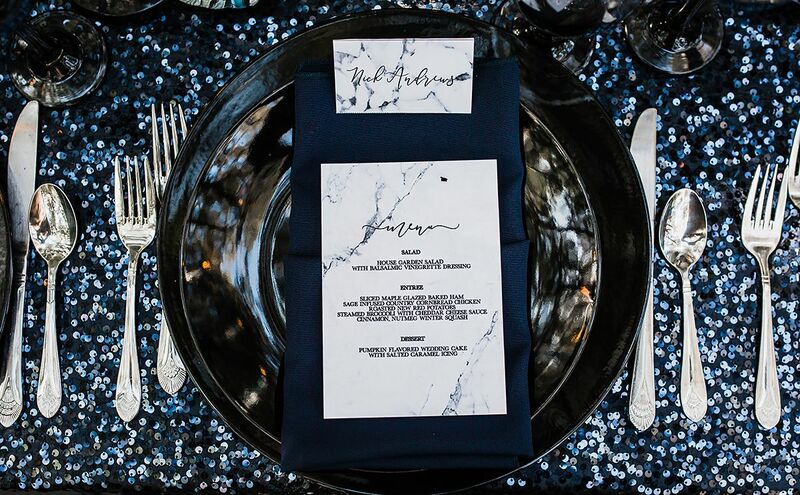 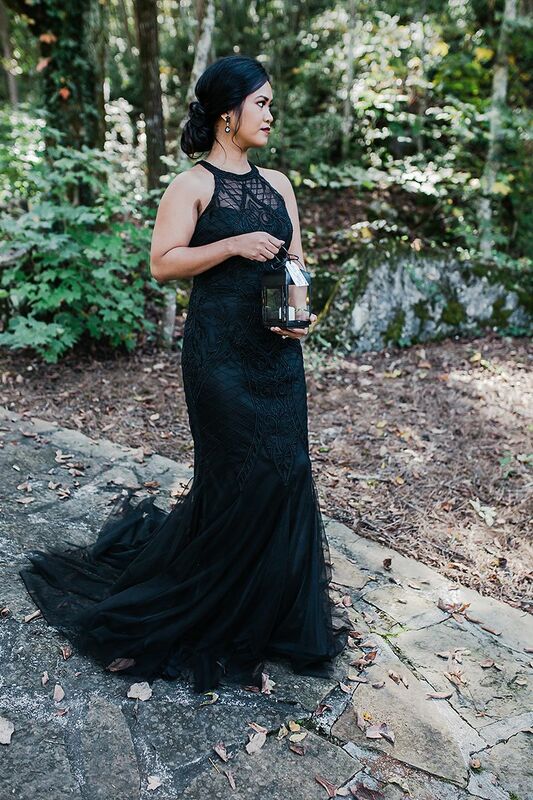 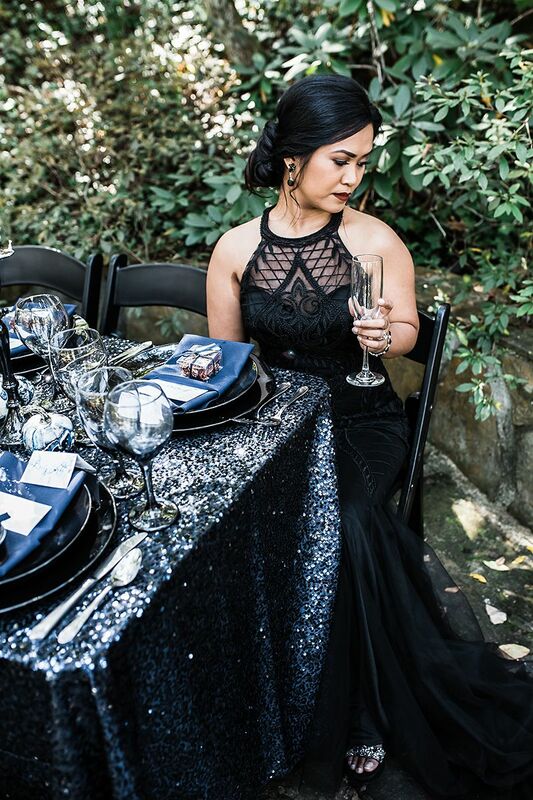 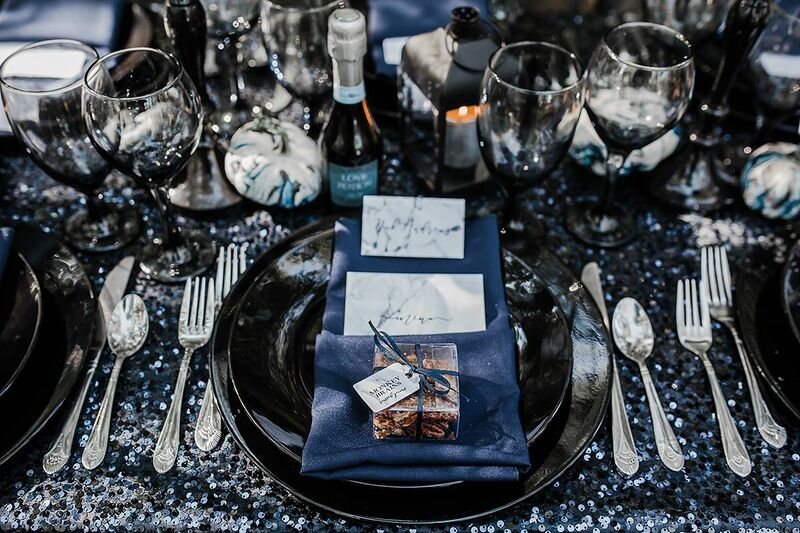 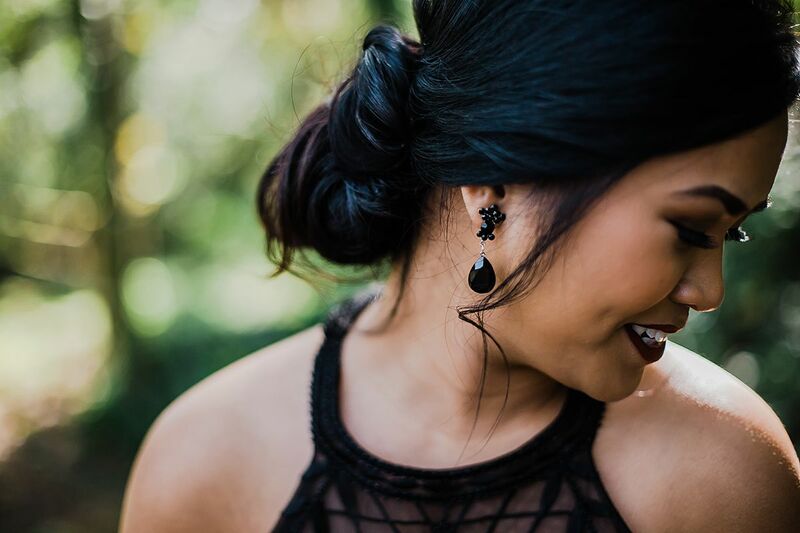 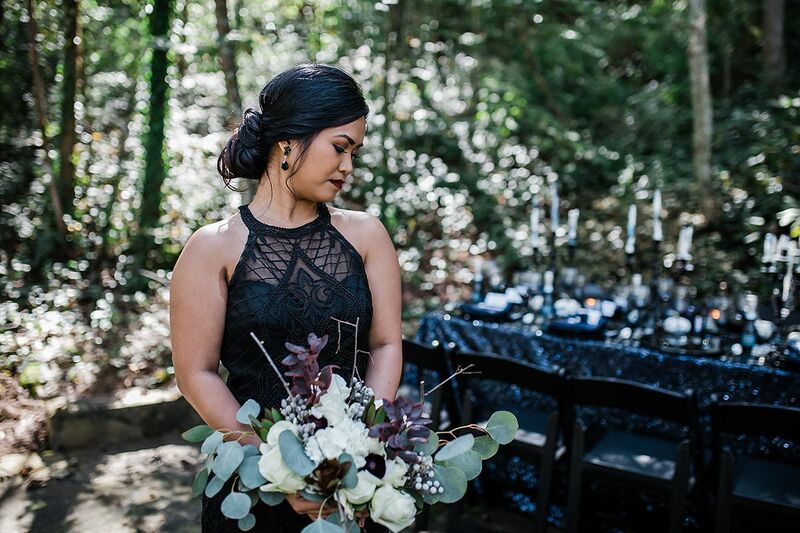 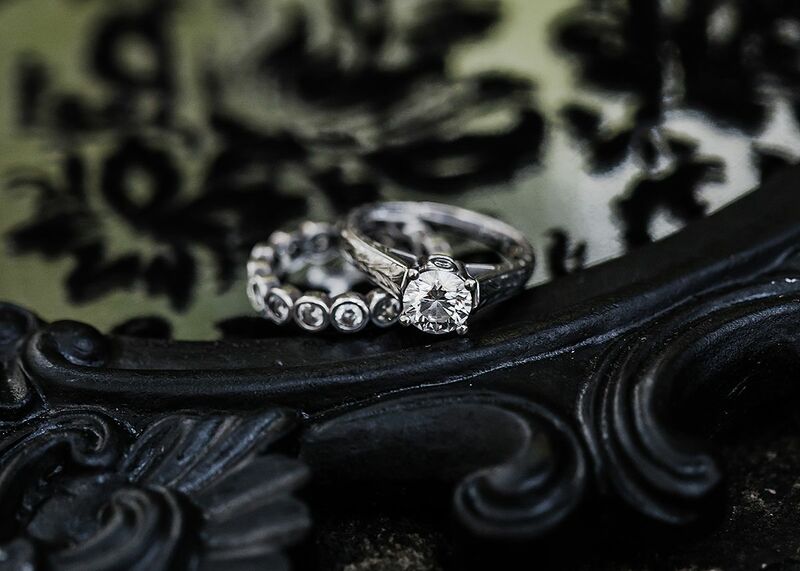 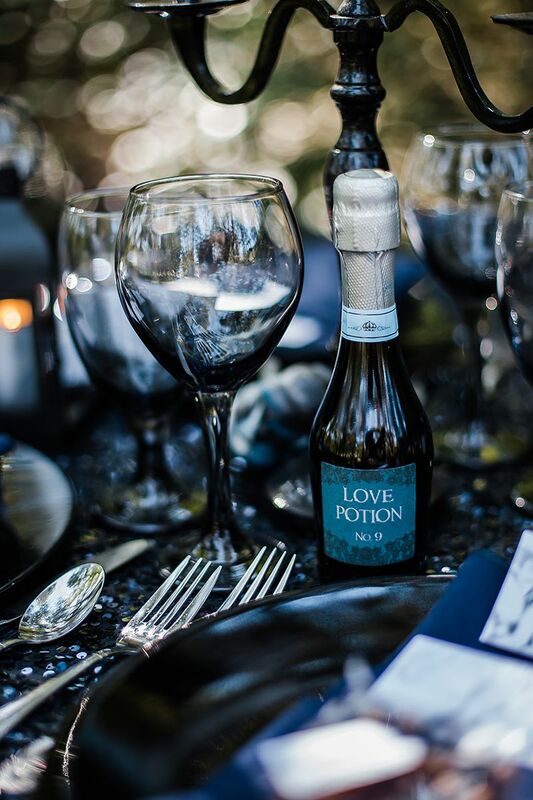 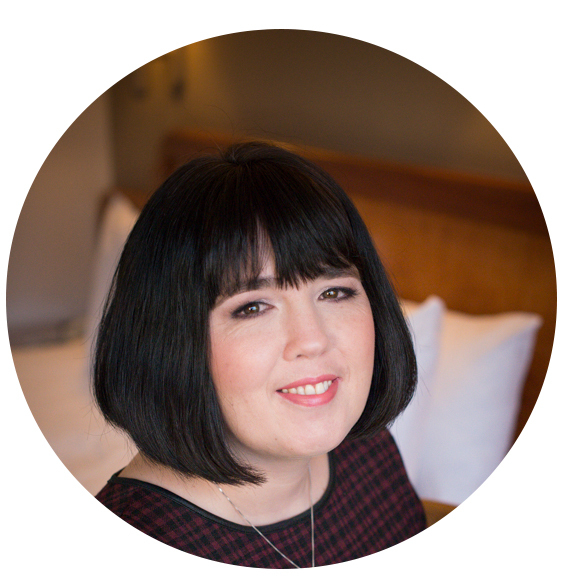 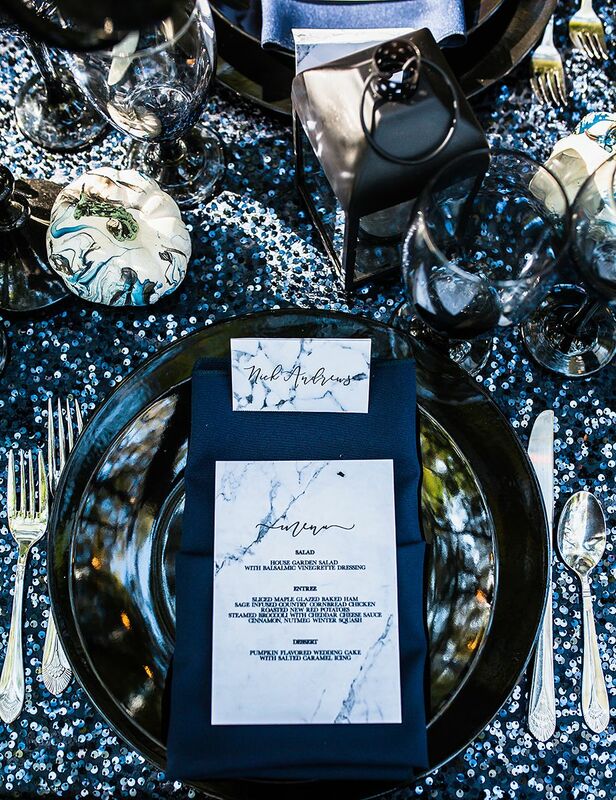 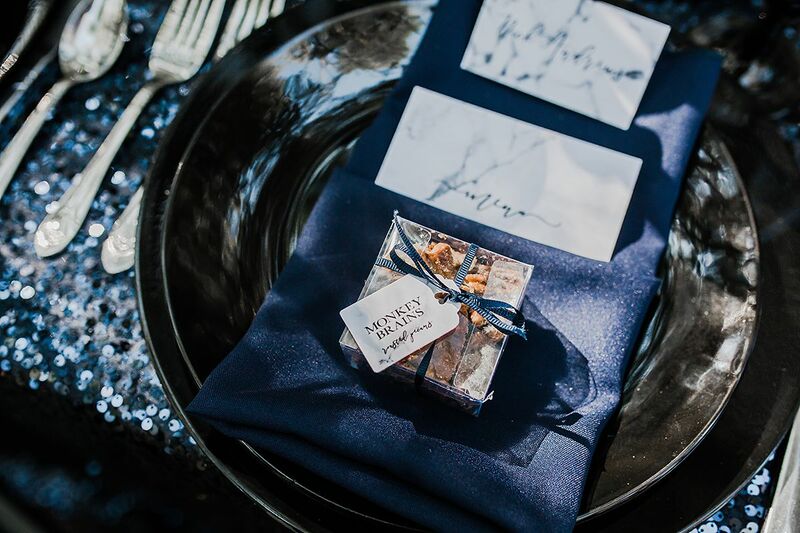 Beyond the tablescape, model Sheila Moore was the perfect bride, smouldering with a dark allure that Kristen Davenport’s beauty services complemented exquisitely. 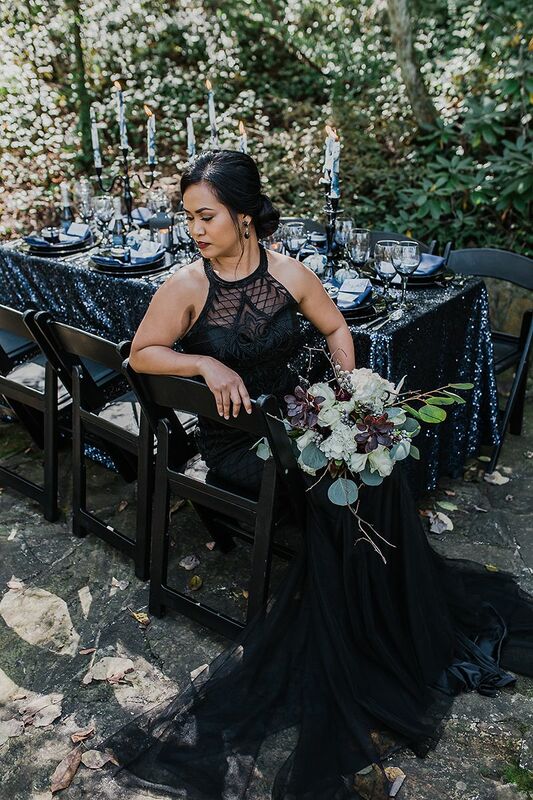 The Gilded Gown’s black tulle trumpet dress, with its delicately beaded décolletage, instantly channeled Halloween bridal couture in its stark contrast against the outdoor setting’s color tones. 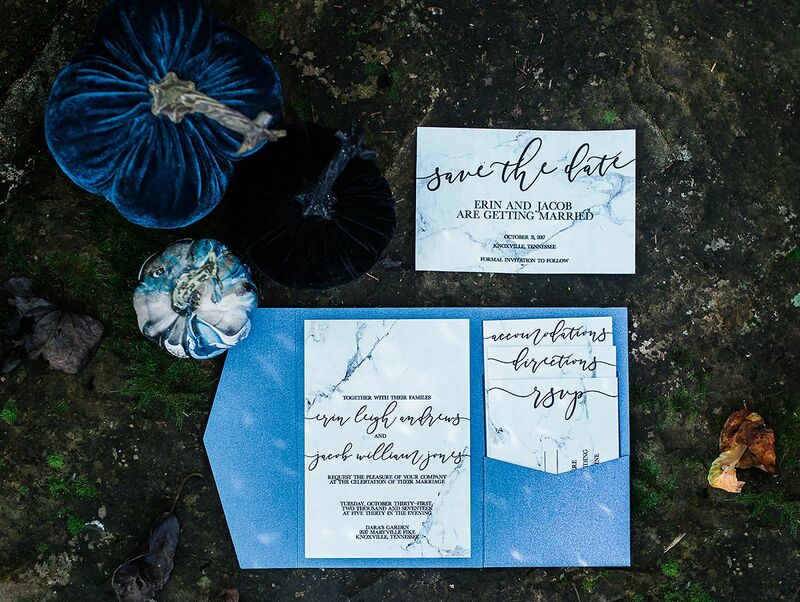 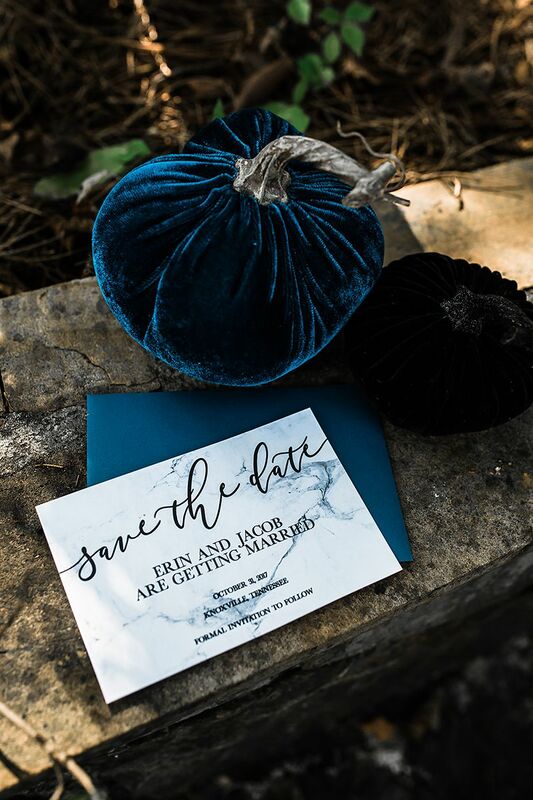 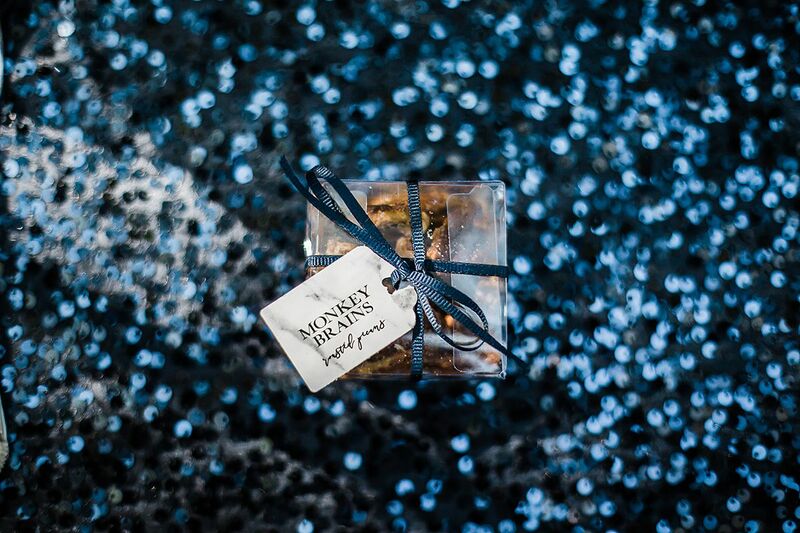 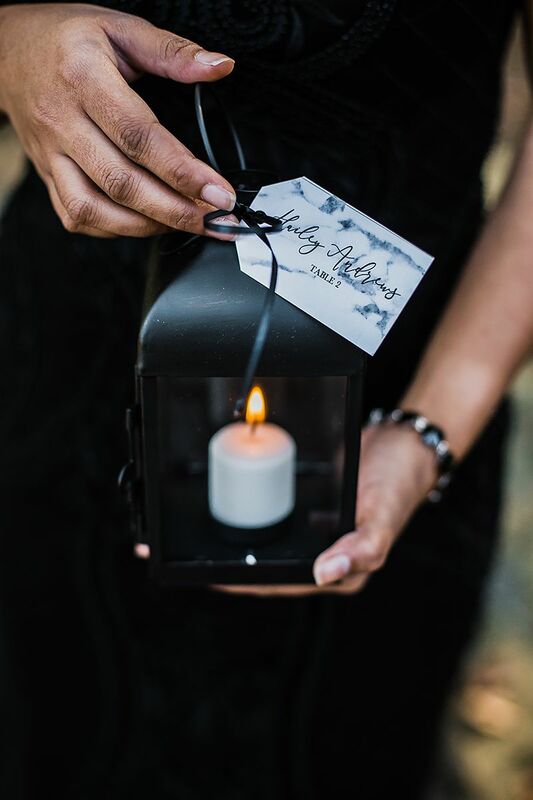 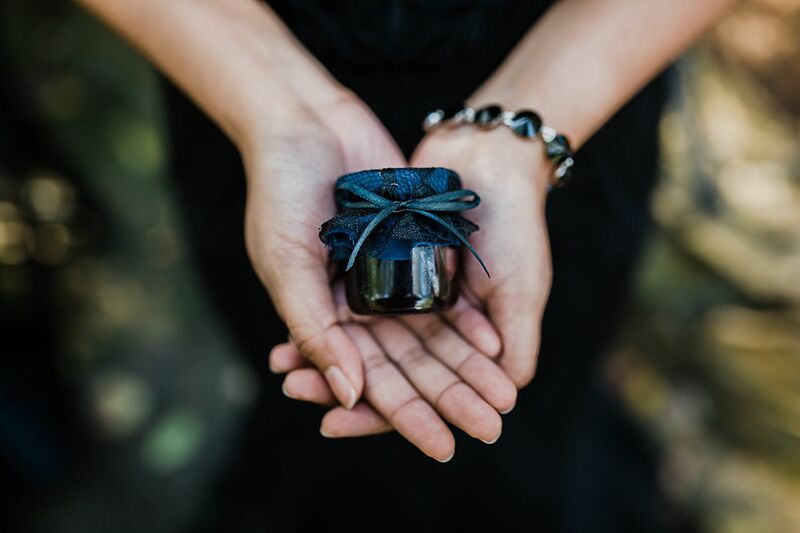 As Amber Lowe Photography’s images gorgeously illustrate, this All Hallow’s Eve aesthetic abandons any preconceived notions about what a Halloween wedding should look like, and instead demonstrates all that one could be.